“Thank you to everyone who came out to #SupportSurvivors yesterday and to the Jewish Women's Foundation of Greater Pittsburgh and the Women's Law Project for co-hosting this important event. Thank you especially to Sue Frische and Megan Block for educating us on why it is so crucial to raise our voices and keep Betsy DeVos' #HandsOffIX. The Department of Education will accept public comments until January 28th, so use the Women's Law Project guide here to speak up from wherever you are!” From the National Council of Jewish Women, Pittsburgh Section. It is with a heavy heart that we share the passing of our dear friend and fearless leader, Nancy Schwartz Sternoff. May her memory be a blessing. On December 12th, the 2018 Shavot Center's Gender Index presented at the Knesset Committee for Gender Equality and the Status of Women. Pictured, MK Aida Touma, the committee chair, opened the session with heartfelt and moving words about the 25th victim of femicide, Iman Awwad, 29, from Acre, who was murdered earlier that week. The index, now in its fifth year, is the most comprehensive index for gender inequality; it includes 13 different parameters: education, labor market, vocational gendering, economic insecurity and poverty, political and corporate power, culture and media, family status, time economy, violence, health as well as specific focus on women in the Haredi and Arab communities and women in geographically marginalized communities. Also pictured, member organizations that supported the event: Greater Miami Jewish Federation, קרן דפנה - נשים משתפות פעולה לשינוי, Jewish Women's Fund of Atlanta, Tikkun Olam Women's Foundation of Greater Washington, Jewish Women's Foundation of the Greater Palm Beaches. 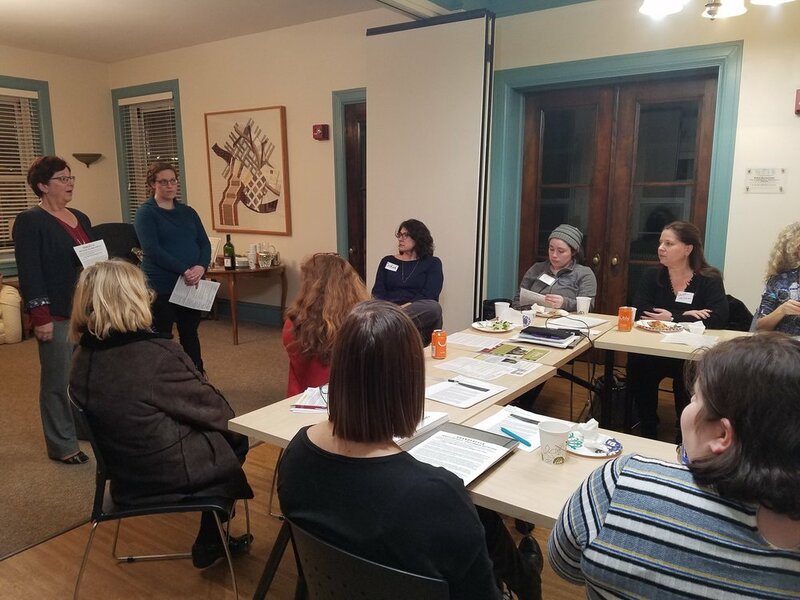 We are proud to share the latest advocacy accomplishments from member organization, Jewish Women's Foundation of Metropolitan Chicago. Their grantees include Sisterhood of Salaam Shalom, jGirls Magazine, and Women of the Wall. Read more about their advocacy efforts here. EJewish Philanthropy named the Jewish Women's Funding Network as one of its top 5 Jewish Philanthropy Trends to Watch. "Looking further, less than seven percent of foundation giving nationwide supports women and girls and two percent of funding goes to combat gender-based violence. But the Jewish community has a powerful advantage: the scores of Jewish women’s foundations in cities across North America which often evaluate needs of Jewish women and girls in their communities. Their findings can give us a head start. They are local resources just waiting to be deployed." Click here to read more of the article from EJewish Philanthropy. Learn about the work of the Hadassah Foundation--an investor in social change for women and girls in the United States and in Israel. New RFP Process for Grantees Too! Our new RFP is posted on our website--if you are supporting an organization that meets our criteria, please encourage them to apply! The Hadassah Foundation is seeking proposals for projects, curricula, and training programs that will enhance the leadership capacity of Jewish girls and young women ages 12-30 in the United States. All applications, to be submitted by email only, are due by February 5, 2018. The grant term will be July 1, 2018–June 30, 2019. Jewish Women's Funding of Greater Pittsburgh with Community Day School present: Snaps, Sexts, Selfies and Self-Esteem: The Tongue-Twisting World of Girls and Social Media with Lisa Hinkelman, Ph.D. The Women of Vision giving circle at the Jewish Federation of Greater Philadelphia recently announced $99,000 in grants. Started in 1994, Women of Vision funds programs that impact the lives of Jewish women and girls across generations, with the goals of social justice and social change. Their 2017-18 grantees are a diverse set of organizations focused on a range of issues including gun violence and the legal needs of senior citizens. Join us in celebrating Women of Vision’s inspiring grantees: Interfaith Center of Greater Philadelphia (pictured above), CeaseFirePA, SeniorLAW Center and ATZUM - Justice Works. Because you are important to us, we wanted to share this exciting news with you. Today, we are announcing that, following an extensive national search, Lindy Eichenbaum Lent will be the next president and CEO of Rose Community Foundation. Lent comes to the Foundation from the nonprofit Civic Center Conservancy, where she has served as executive director since 2009. Rose Community Foundation began its search for a new president and CEO following the unexpected death of its 18-year leader Sheila Bugdanowitz in December 2016. Lent will assume the role on November 27, 2017. Want to connect with others and get involved in your Jewish community? The Greater Miami Jewish Federation has lots of events planned for October. From volunteer opportunities and celebrations to children's events and community gatherings, there are plenty of options. Click here to learn what the Greater Miami Jewish Federation suggests! "At JWFNY we constantly re-evaluate how we assess grant applicants and how we utilize our Jewish values as women and as philanthropists. In her recent ELI Talk, JWFNY President Debbie Cosgrove discusses how the Four Children at the Seder Table can teach us about nurturing a philanthropic portfolio that is expansive, inclusive, holistic, and nimble." Thirteen members of Miami’s Jewish community recently spent a week in Israel observing the work of Federation's Women's Amutot Initiative and Israel and Overseas Committee. The whirlwind of a trip included site visits to a number of non-governmental organizations (NGOs) and Federation beneficiary agencies throughout the country.